If you want a child to learn to write, it may come as a surprise that sticking a pencil in their hand may not be the best way of going about it. 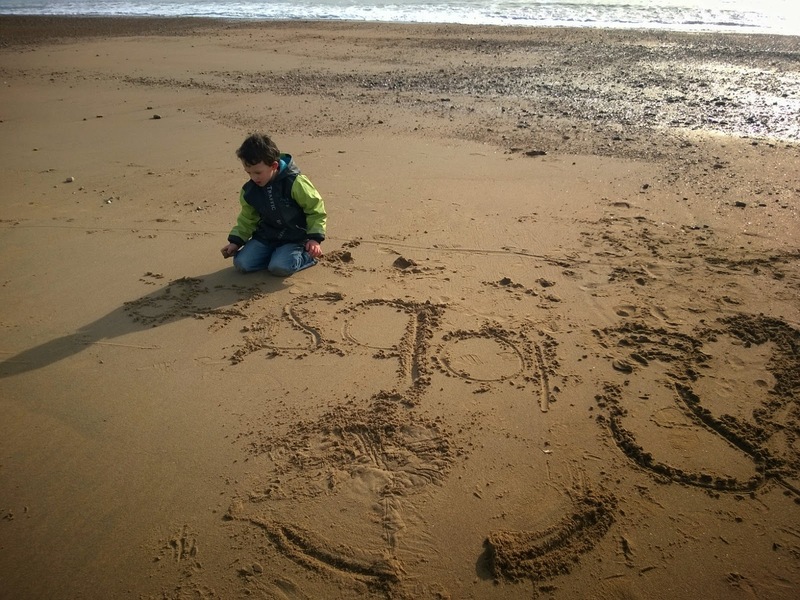 Writing in wet sand stimulates more regions of the brain due to its multisensory nature and as such the letters that a child forms with their finger in the sand tend to be more memorable than the marks they make on paper. The more physically active and multisensory you can make an experience the more it will be memorable, so using our whole bodies during learning the alphabet and counting is a big part of what we do. I noticed how playing hopscotch had an immediate effect on Toby's ability to count in a correctly ordered sequence, so today I made up an alphabet game. I wrote the alphabet a line at a time as in the song, then we held hands and shouted the line while jumping on the letters. At the end of a line we ran down to the bottom and right around back up to the start of the next line and continued until we had done the whole alphabet. After about three complete alphabets we were puffed out, so it's also good for making up the hour a day minimum physical activity that is recommended for kids. Ollie then decided to draw the big lobster we had seen in the aquarium that morning, and when he finished his picture I suggested he write 'lobster' next to his picture. 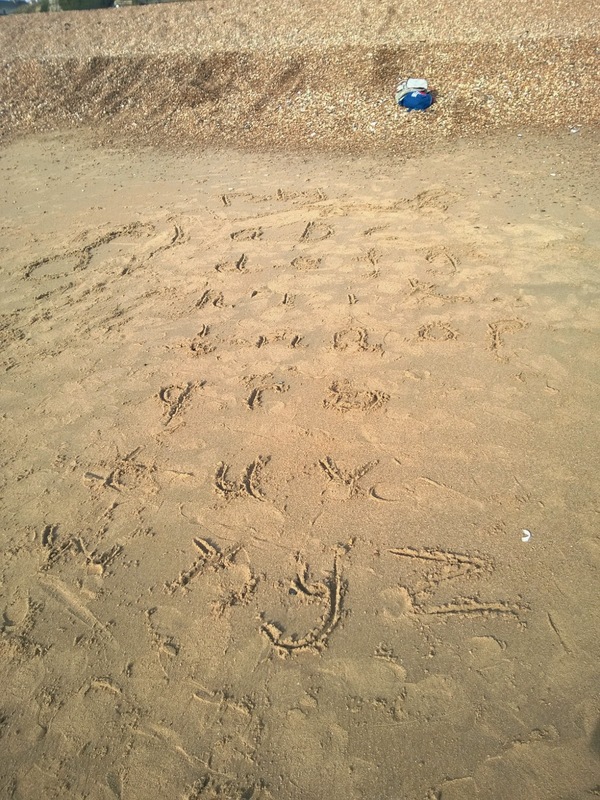 He needed a little help working out how to spell it, but each time we write on the beach I notice an improvement in his memory for the letters he sometimes muddles such as 'b' and 'd'. Lobster was a handy choice as it is a nice phonetic word with no tricky sounds so he was pleased to be able work out most of it for himself. Toby has started shouting out 'look. there a T like in my name!' 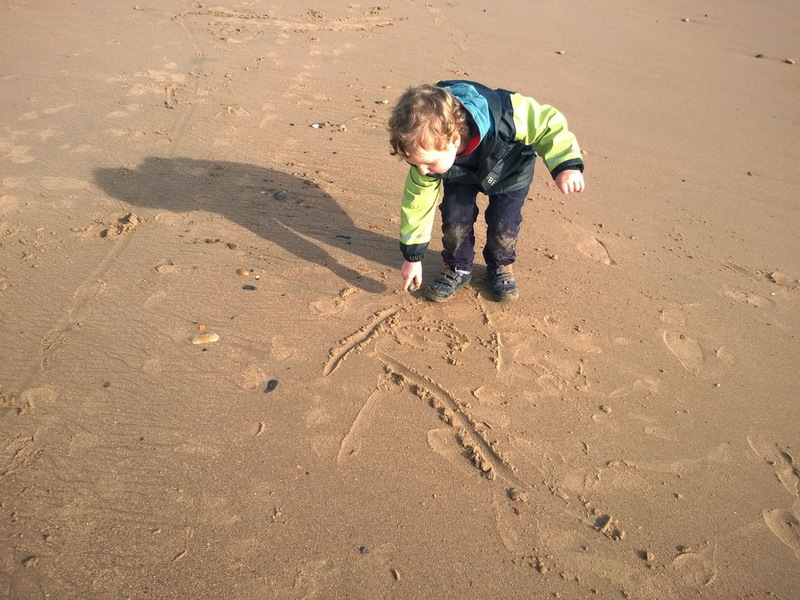 every time he sees a T written down, and occasionally writes a pretty convincing version of 'Toby' on his pictures, so I wasn't surprised when he started to write his name on the beach. I was amazed though at how clear it was. I haven't pushed either of the boys with holding a pen correctly - just each time they start to write or draw I will adjust their hold once and then leave them to how ever they want to hold it after that. With Ollie he was holding a pen in a correct grip at around 2, but Toby at 3 is still preferring a fist grip and regularly switches which hand he uses, so I was interested to see he favoured his right hand during sand drawing. As a break between numeracy and literacy games I drew start and finish lines in the sand and we ran races up and down the beach in different ways - running, hopping, jumping, running backwards. The boys also did plenty of digging, stone throwing, making sand angels and watching the gulls fly overhead. One of the benefits of learning outside is that pure open ended play and learning games can run seamlessly into one another. We did counting, adding, subtracting, multiplying and dividing using a 'picnic' made of pebbles. Our final game before we left was a numbered scavenger hunt for pebbles. 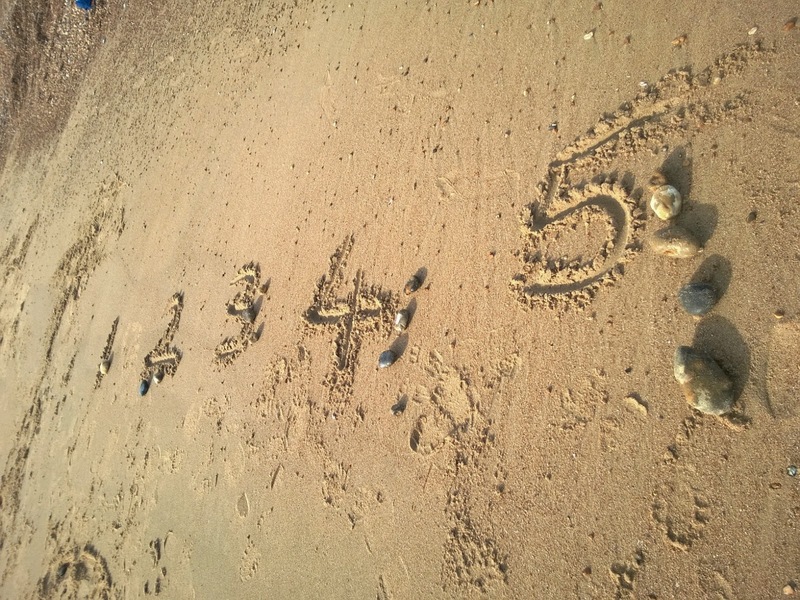 I wrote numbers in the sand and we ran up and down collecting pebbles and adding them in the correct amounts next to the numbers. Ollie did his numbers by himself and I helped Toby. All of these games can be done in a back yard with a sand pit, or in mud, or flour or shaving foam. The scavenger game can be played with numbers chalked on a patio and any item to collect that is in season, such as leaves or daisies. How you do it is limited only by your imagination, and if that runs out the kids are bound to have brilliant suggestions and are more likely to play games they have helped to devise too.